How should communities deal with violent and dark history - particularly when it influences the present? Current students at the University of Virginia share their thoughts on the violent white supremacist rally last summer and the lasting impact it had on campus. This podcast is part of our ongoing Transatlantic Partnership on Memory, Responsibility, & Transformation with the University of Virginia. On August 11th, only a week and a half before the start of class at the University of Virginia (UVA), white supremacists marched through campus as part of the “Unite the Right Rally,” chanting racist and anti-Semitic slogans. 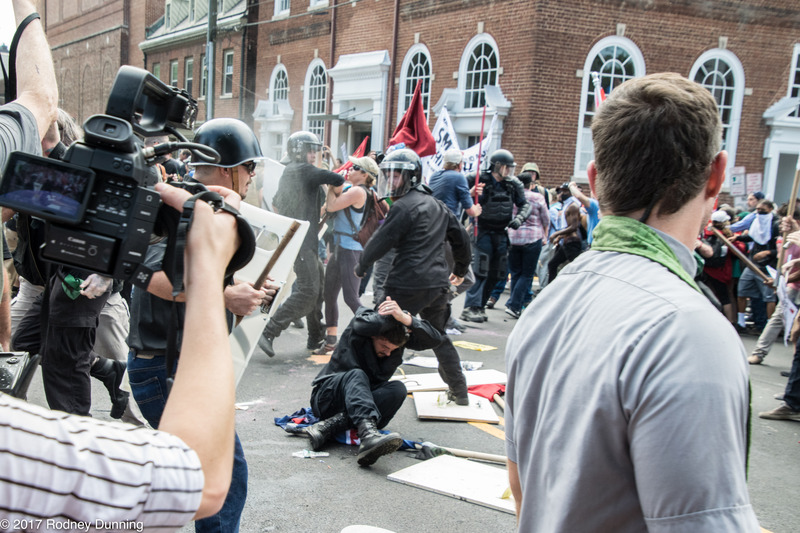 The next day, on August 12th, things turne increasingly violent as white supremacists clashed with counter-protesters in demonstrations and physical altercations in downtown Charlottesville near the city’s contested Robert E. Lee statue. A man drove a car into a crowd of these counter-protestors, killing a young woman named Heather Heyer. Two first responders also died in a helicopter crash in relation to the events that day. Since these events on August 11th and 12th, the University and the wider Charlottesville community have attempted to come to terms with what happened, including official responses, working groups, and ongoing projects. What has life been like for students returning to campus so soon after these events? I interviewed four students on UVA’s campus to talk to them about their experiences since this past summer as well as their thoughts on dealing with difficult parts of the past. I think the biggest thing I felt at the time was shock. 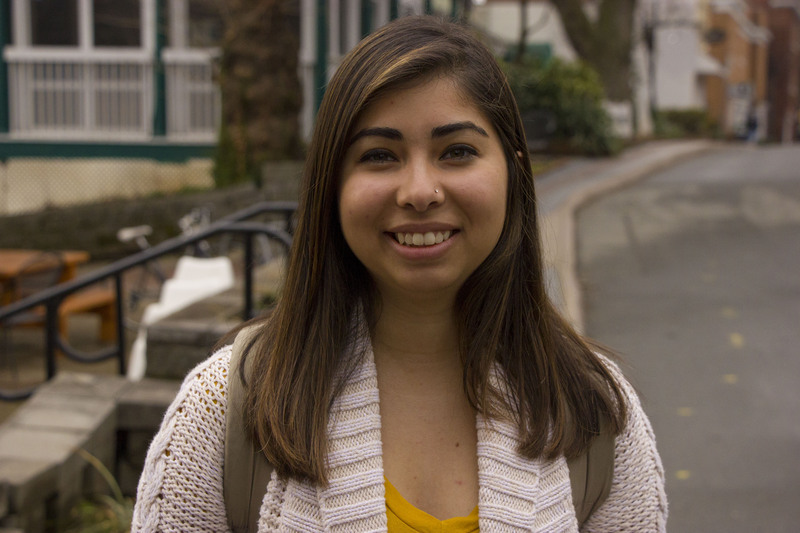 That’s Lauren, a second year at UVA, who describes herself as an active member of the Hispanic community on campus. She was at home in Northern Virginia at the time of the white supremacist rally. I felt distant from it because I was two hours away, but I had acquaintances who were back. I heard that everyone was saying, “Stay inside, don’t go outside, lock your door.” I was like, “Wow, I’m glad I’m not there,” just because I was scared of it. For many students like Lauren, the events of the summer were viewed from afar with a sense of anxiety. My sister worked here in the summer –she’s a fourth year here. So she was here, but on the day that the rally was happening, she came home. My mom was like, "I’d rather you not be there," because she thought it was going to be bad. My sister felt bad - that she should be there. I also felt like I should be there, to represent our school, because this is not our school at all. I mean, maybe not our school. But our [university's] history falls in line with some of those views - how it was built and everything. Which, I have a hard time dealing with that - how to deal with it, if I should deal with it. What Katie’s referring to is UVA’s history of slavery. 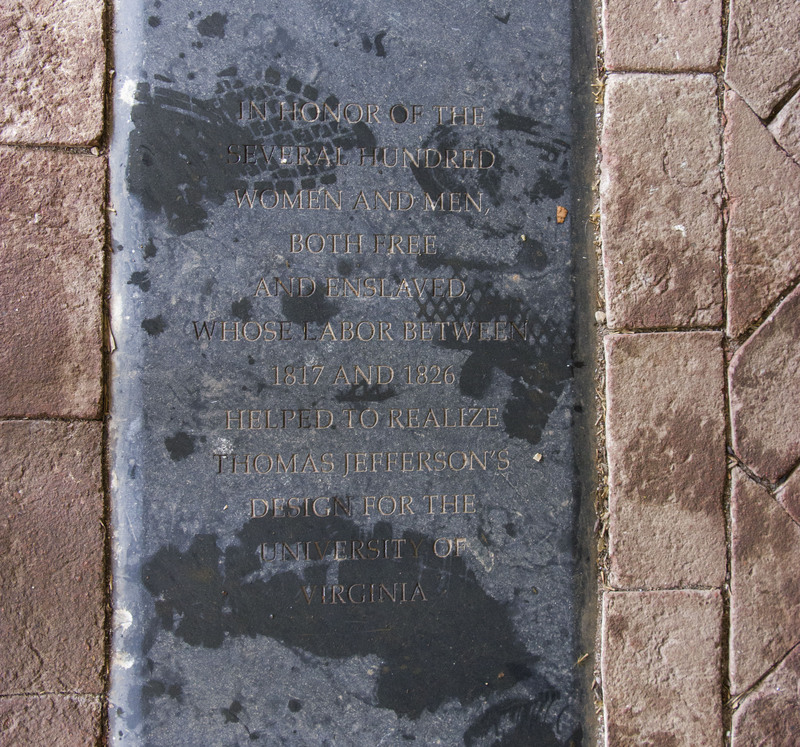 The University of Virginia was founded by Thomas Jefferson, a Founding Father who was also a slave owner. The University was built by enslaved labor, and slaves continued to serve students for decades after the University opened until they were freed just after the Civil War. So she [Katie's sister] came home, and we felt bad that we weren’t there. Then it all went horribly. It was very upsetting to see people talking on Twitter saying: "How could UVA let this happen? Why did UVA let this happen? Why did they invite them here?" But we didn’t. It wasn’t our choice. We’re a public institution. People are allowed to be on our grounds and walk around and come express themselves... And I was really proud to see some of our students standing around the statue with signs up and everything, protesting. But I was also scared for them. On August 16th, students and community members gathered for a peaceful demonstration in the main area of campus – known as the Lawn – by holding a candlelight vigil. In part, this was to counter the images of white supremacists gathering in the same spot with Tiki Torches just a few days earlier. I was never scared to come back here. I think part of that is because, after all this happened, we had the huge student candlelight vigil on the Lawn. Which meant that tons of people came back. I just remember seeing the pictures and seeing the whole Lawn flooded with candles and with students who are so dedicated to making this place better. And I was felt like, "I’m not scared to come back here." Because whatever that was, that’s not my home, that’s not my UVA, that’s not my college town. That’s not going to define my whole time here. And I think a lot of my friends felt the same. We weren’t really scared. Yeah, we were nervous, and yeah, there were parts where we were like, "Is this dangerous?" But UVA did step up security measures. And for the most part - I think, at least my friends - we weren’t scared to come back. We were ready, in a sense, to come back and be here in our favorite place. Some students were on campus during the events of August 11th and 12th. 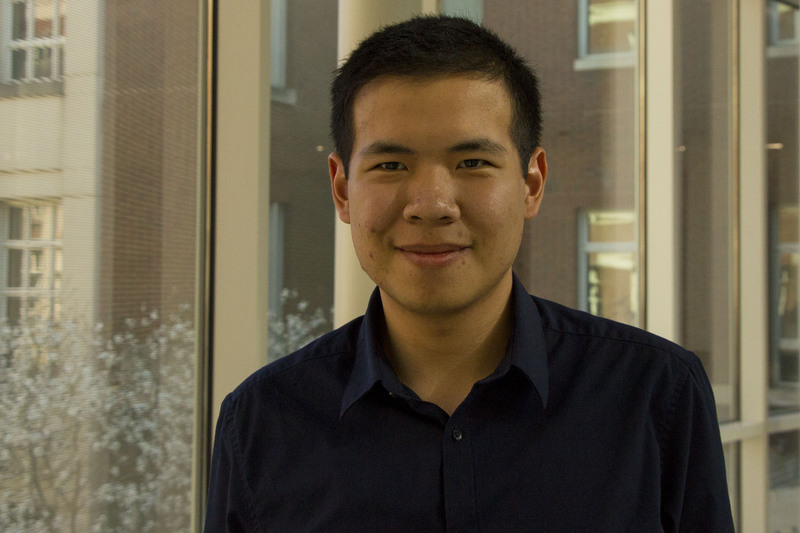 Pasuth, a third-year international student from Bangkok, Thailand, is part of a program called Global Greeters. The organization helps to welcome incoming international students with a week-long orientation just before the start of class. It was interesting that I was actively working and planning towards receiving another class of people from all backgrounds, all religions, and all nationalities, and to have this backdrop of white supremacists and neo-Nazis – everything that stands against the diverse nature of UVA Grounds. We made an even greater effort to not only explain the events but also to explain what the University community is. What was also great was on Wednesday night - which was the same night as our international student welcome dinner - it was the candlelight vigil on the Lawn. It was extremely appropriate that the night we were welcoming all these international students, there was also a display of our community being united and standing for our true values against those unwanted groups that were here. What was good was, even after all that, throughout the entire orientation week I could feel that the new students felt welcome. Especially people from the religious or ethnic backgrounds that were targeted by the perpetrators on August 11th and 12th. It was good to know that we’re doing well. That people felt that they were welcomed. This year should be my first year here. I think my orientation started on August 16th – it was super close. And I was a little bit terrified at first. I didn’t even tell my mom, because she would have been very nervous about this. While the topic may have receded from the national spotlight, the community is still dealing with the impact of the white supremacist rally and the legacy of the Robert E. Lee statue. Many in the community have called for the statue’s removal. 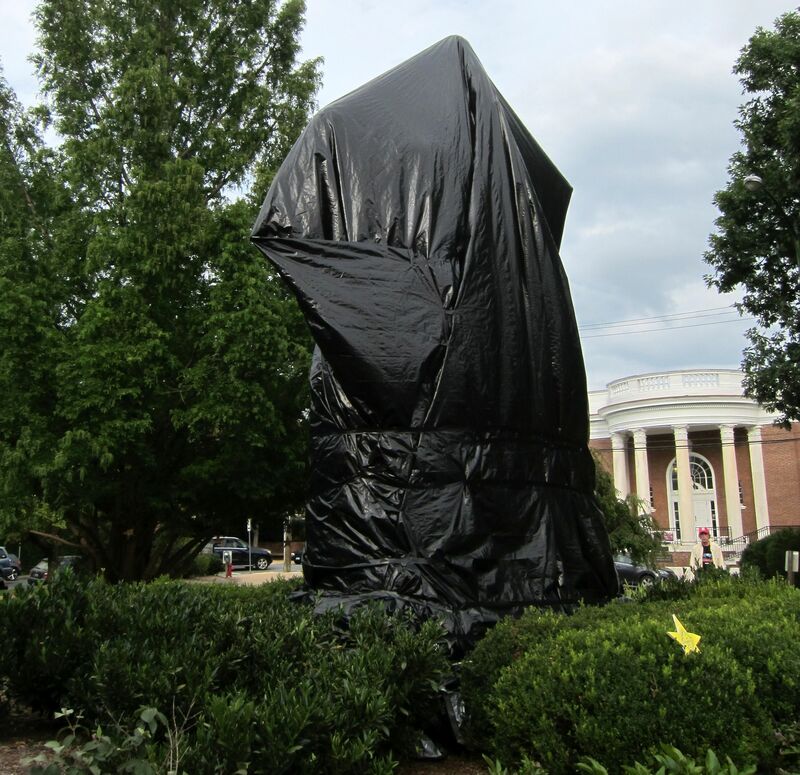 The Charlottesville City Council voted unanimously to place black shrouds over the statue in honor of those who died on August 12th. But a recent court case resulted in a judge ordering the shrouds to be removed due to a Virginia law that prohibits the removal of war memorials. What did students think coming back to campus with this debate ongoing in the background? Did it have an impact on campus life? I noticed a change when we first got back to school. I think people were on edge but also pumped up. Like, "Let’s take this down, let’s get rid of this [statue]." Since then, people don’t think about it in their everyday lives anymore. But at the same time, the conversation hasn’t ended. Every single club that I’m a part of is still talking about it. People are now being active and trying to figure out: "Okay, now we’re not scared anymore. We know this happened. Now how do we move forward from here?" There’s been a lot of conversation about how to move forward... it’s opened up a whole dialogue that was not there before. I think people are more aware of race relations, and how everybody has a role to play in the issue. I think people who thought this wasn’t maybe becoming a problem anymore realized that it is still a problem and aren’t as complacent in saying "Oh, racism is over." Now people are like, "Oh, it’s not over. Right - we have to get back into the fight." 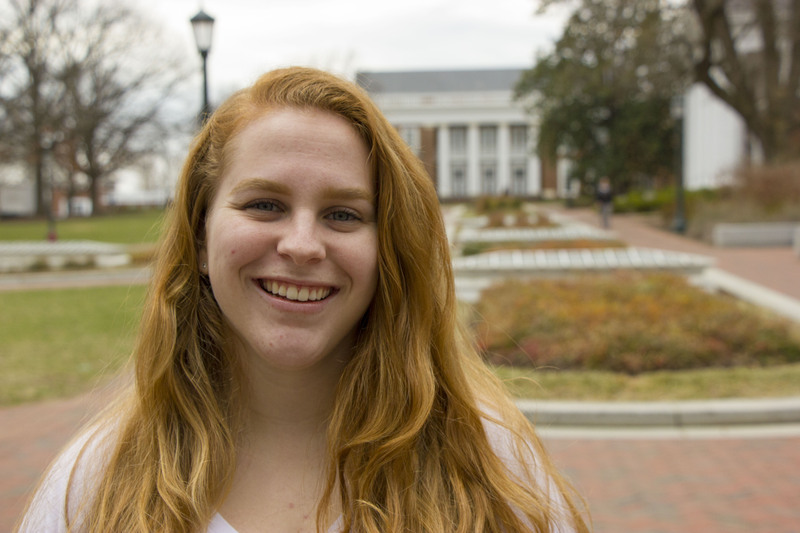 For Katie, she felt that the events did cause her to rethink her perspective on the Robert E. Lee statue and on UVA’s history. I think it’s definitely shocked everyone into being more conscious about it – about our history and how other minority students might be feeling. I never felt unsafe, even coming back. I just didn’t think about it that way. But then I realized that students who are minorities definitely did come back and felt more unsafe and more unwelcome. It reminded me that we are in the south, that it is a Civil War statue in Lee Park [now Emancipation Park]. It’s upsetting to think that I didn’t really realize that before. But it’s definitely made me more aware and it’s made everyone else more aware. So, a lot of self-reflection. And it’s sparked a conversation that I think students and other professors, especially where it’s their area of study, have been trying to have for a really long time. Especially black students and black faculty - I think it’s been really hard for them to get a conversation going. Now that it happened, it’s good [to be having these conversations] but it’s also sad that it took so long and such a big event…. For many students of color at UVA, these events did not come out of the blue. In a state in which nearly 20% of its population identifies as black, Virginia’s flagship public university has a black undergraduate population of only 6.5%. In classroom conversations, black students often voiced frustration with what they saw as the University’s tendency to only make symbolic changes – such as renaming a building – rather than tackling structural problems like the lack of diversity on campus. Student-led initiatives have been an important counterweight to this. One initiative is the Univerisity Guide Service, an independent student organization that runs campus tours that are open to the public. Tour guides make a point to outline the history of slavery and segregation at UVA. They gave us a tour that reflected the history of the University with slavery. In the back of my mind, I knew that, prior to the Civil War in the American South, slavery was a big thing. But I didn’t realize the magnitude that it was - especially connected to the University. To the extent that practically the entire University was built by enslaved labor. I thought that was an extremely humbling experience to learn. We walk past the Lawn all the time - it’s a beautiful place. But it’s also pretty important to remember people who aren’t necessarily being remembered in history. The University’s history of slavery is also important for understanding why white supremacist chose UVA and Charlottesville as a place to gather. Lauren is a campus tour guide, and she described the University’s role during the Civil War, and why that matters today. During the time of the Civil War, [UVA] stayed open. But most kids went to fight in it, and then UVA became a hospital set up. The Rotunda became a hospital, the Lawn Rooms became the nursing places, and the slaves would help treat the wounded soldiers - which is insane because they were Confederate Soldiers. Which is also interesting, because that brings it back to what happened on August 11th and 12th. We were trying to figure out why it happened here, and it makes so much sense that it happened here. We have all this history that goes back to a predominately white, Southern Confederate place. But now we’re a liberal college campus. I guess white supremacist are like, "You’re a traitor," in the sense that we’re not what we used to be. And Charlottesville has always had so many issues with race relations. So it makes sense that it would happen here. With this complex history of UVA’s campus in combination with the events on August 11th and 12th in mind, students had a lot to say about how to deal with difficult history. I’m a pretty big proponent of contextualizing all the monuments. I understand both sides. How you don’t want to just take something down or put something up. But if you put it in a museum context, that’s a different story. Then you’re not saying that we hail this one person and all of - usually his - flaws. You’re saying, "Okay, this is what was up, this is why it was up, this is the other side of the story." Let’s put it all together in one museum. I know there’s a lot of people who don’t like that answer. But... if you want to have more of a conversation around it, I think the only way to do that is to contextualize the history. Katie also expressed a similar attitude about how UVA could address its history. I’d rather be like, "This is what used to be here, here's what we’ve put here now, and here's why we did it." I know there’s a plaque by the Rotunda about the slaves who built it. But at the same time, I don’t think it’s necessarily enough. Also, stop glorifying Thomas Jefferson. He was a Founding Father and obviously did do really good things. But at the same time, he did really bad things. And you can’t ignore them. I think it’s really hard, especially for UVA. It’s so torn in different directions. It wants to be progressive; it wants to have these conversations. But at the same time, it’s so tied to its history and a different side of the spectrum. It’s kind of being pulled in both directions. I understand that it’s hard to change things and it’s easier to erase them. But I think you can’t do that. The events this past summer have made students more aware of UVA’s history of racial discrimination. Many students pointed out that it’s not just about the history of slavery. The University of Virginia also played a prominent role in the American eugenics movement, which influenced Nazi Germany’s racial policies and supported population control measures such as forced sterilization into the 1970s. Several leaders of the eugenics field taught and researched at UVA into the mid 20th century. It was in one of my engagement classes. I expected it to be about biology and genes or something, and then they started talking about eugenics. I almost only knew this topic by accident - only because I chose this class. One interesting thing is that we went to the Rotunda for that class, which was very special. Our professor asked us to look for some information about the history [of eugenics]. It was on the school’s website - everything was on the website, but nobody to really see it. [The professor] asked, "Has anyone told you that UVA was involved in eugenics?" And only two or three students in the class raised their hands -almost no one. Everyone was so surprised that we had that history. The fact that we had that history was surprising. Even in the biology department right now, people avoid talking about that topic. I feel like that’s not what should be happening right now. But while there’s plenty of work to do, it’s also important to acknowledge the progress that has been made. 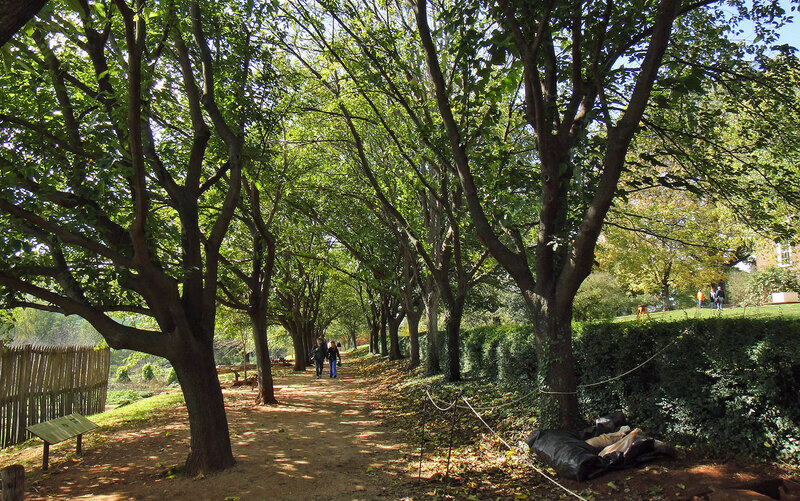 Pasuth explained how the evolution of how Thomas Jefferson's estate Monticello tells its history of slavery illustrates that some positive change is underway. I had a tour of Monticello my second year. [And we learned that] maybe ten or twenty years ago, it was held that they did not recognize Sally Hemmings and the entire enslaved community that [Thomas Jefferson] had. I’m not sure if the memorials and the new exhibits have been finished yet or not. But when I was there, it was interesting to see that under construction, because it really shows some sign of progress. We’re definitely not there yet in telling the full story, but I’m glad that important institutions such as the Thomas Jefferson Foundation at Monticello and the University of Virginia are moving towards it. You know, you can criticize that we’re not there yet. But I think it’s also important to recognize that progress is being made. So what does this mean for students today? What lessons can others draw from the ongoing dialogue in Charlottesville and at UVA on dealing with difficult history? Don’t let adults tell you that your opinion is not important. Because it is. Your opinion is important. And eventually, you will be the ones in charge. So don’t get beaten down. Even though it might be years after the fact, don’t let it die out. Don’t get complacent in the fact that there are still issues. There probably always will be. The only way to ever make any improvement is to take the reins. Don’t let those conversations die. If you have an organization, open a dialogue. Or have an event where you invite leaders from the community. Pick one topic on the subject, pick one issue, and talk about it. It doesn’t have to be argumentative. It can be a constructive dialogue. One big part is to have courage in facing difficult questions. I know as an international student from Asia living in the United States, I’m a lot more disconnected to the deeper legacies here. But it is not unreasonable for people in the United States to shy away from digging into those questions - because it might have some effect on who their families were in the past. But I think that you can’t really move forward without knowing the true story of your past. The rallies and attacks by white supremacists on August 11th and 12th, 2017, shocked not only the Charlottesville community but the country as a whole. It brought up centuries-old tensions around race and national identity and sparked conversations that many black Americans have wanted to have for a long time. From these terrible events, there is hope. People are having difficult and often uncomfortable conversations, including students at UVA, the residents of Charlottesville, and so many people across the country. These are conversations about racism, enduring inequalities, the power of historical narrative, and the dark chapters of history we often sweep under the rug. And positive change might be possible - as long as we keep talking and listening to each other. In response to the events in Charlottesville, the Heinrich Böll Foundation North America with the Center for German Studies and the University of Virginia launched the Transatlantic Partnership on Memory, Responsibility, & Transformation. 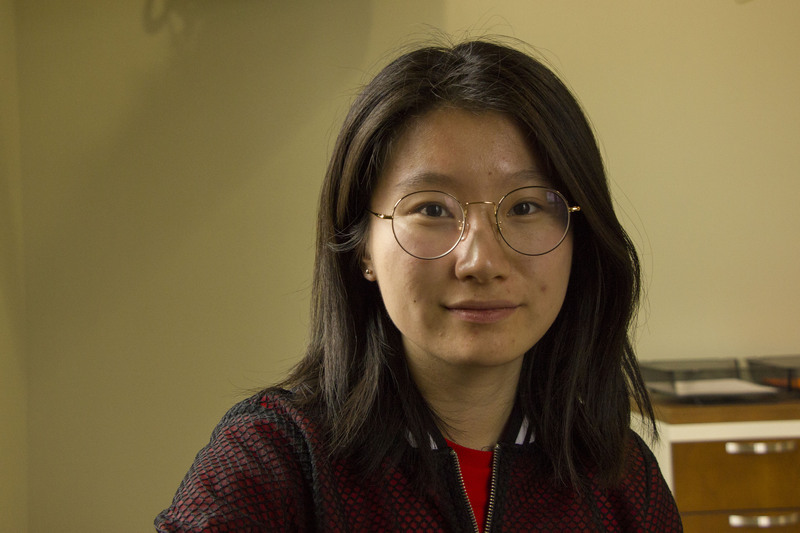 This ongoing project connects German fellow with UVA faculty to offer students applied interactive projects that explored a range of intellectual and artistic tools for dealing with the past. Fellows were chosen for their expertise in activism, public history, photography, museum curation, and documentary theater. 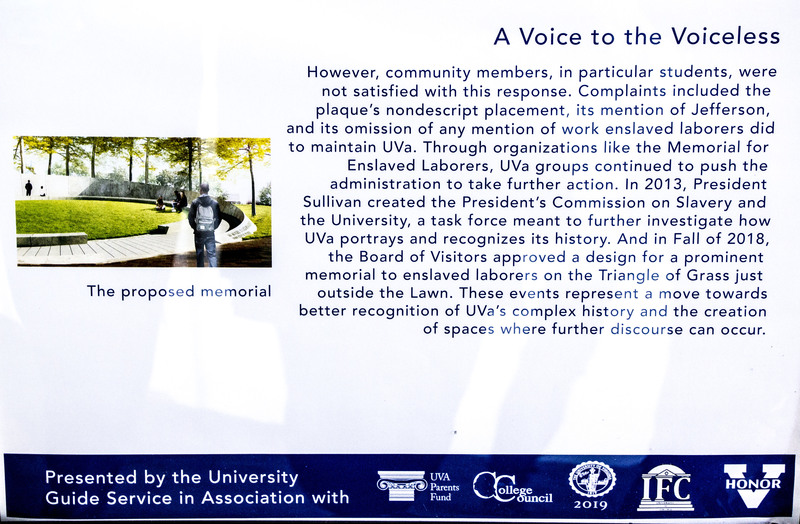 The project is part of a wider University response to the events in August 2017, and was co-sponsored by the University’s Collective Response: Moving Forward Fund of the College of Arts and Sciences. 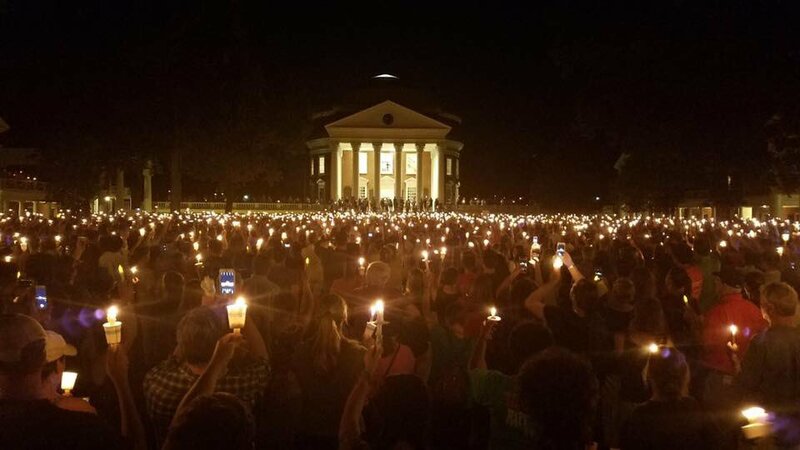 a. Tweet on August 11, 2017: "White nationalist alt-right torchlit march going through UVA grounds: "you will not replace us""
b. Tweet on August 11, 2017: "They are moving towards the lawn"
c. Tweet on August 12, 2017: "Unlawful assembly declared "
d. Tweet on August 12, 2017: "Scene near Emancipation Park #Charlottesville"
e. Tweet on August 17, 2017: ""Don't let hatred blow it out, I'm gonna let it shine" #Charlottesville"
f. Tweet on August 16, 2017: "#BlackLivesMatter here, I'm gonna let it shine" #UVA #Charlottesville"
UVA student Ali reflects on the events of August 11th and 12th, 2017, in this personal documentary theater piece.